Sunday Times #1 bestselling author David Baldacci is releasing his first book for young adults. Titled 'The Finisher', it carries similar themes to the Hunger Games trilogy. For more info, visit the official website at TheFinisher.co.uk. The only world that Vega Jane has ever known is Wormwood. This poverty-stricken, stifled village - Vega’s home - has long been a prisoner of its own superstition, the high perimeter walls keeping out unwelcome visitors … and keeping in its dwellers. No one has ever left. Until now. When Vega’s mentor, Quentin Herms, is seen running into the wild outside the village walls, everyone assumes he will soon be dead, killed by the terrifying beasts that stalk the tangled, dark forest. No one, apart from Vega, seems to care. Rumours are whispered among the townsfolk, encouraged by the tyrants who run Wormwood. Quentin was a traitor, who chose his tragic fate as an alternative to a lifetime of imprisonment. Vega knows differently. There is something more to Quentin’s disappearance than meets the eye. What if he wasn’t running from something, but was running towards something? Why are the authorities so determined to keep what lies beyond the walls so secret? 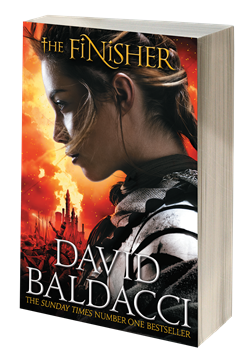 The Finisher is the electrifying first novel for younger readers from the bestselling author David Baldacci. With a feisty heroine to rival Katniss Everdeen, and set in a world richly imagined and teeming with a cast of unforgettable characters and a menagerie of terrifying beasts, this is the must-read novel for spring 2014. David Baldacci is a worldwide bestselling novelist. With his books published in over 45 different languages and in more than 80 countries, and with over 110 million copies in print, he is one of the world’s favourite storytellers. David is also the co-founder, along with his wife, of the Wish You Well Foundation, a non-profit organization, dedicated to eliminating illiteracy across America. David lives in Virginia, USA. For more information please visit www.DavidBaldacci.com. The Finisher will publish in the UK on March 4th 2014, in paperback original and priced at £7.99. It is best suited for readers aged 11+.